Leg yielding asks the horse to move forward and sideways at the same time while his spine stays parallel to the rail. Shoulder-in is the first lateral movement that asks the horse to bend through the ribcage as he moves on a straight line. When shoulder-in is not working, regroup by riding a circle. As the circle touches the wall, take one step along the rail and then go back to circling. Gradually increase to two steps along the wall, then three, etc. Go slowly in asking a young horse to increase the number of steps in shoulder-in. 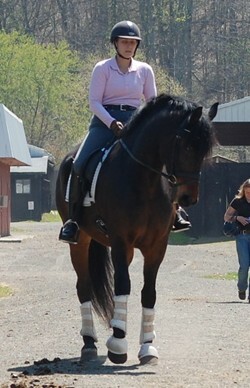 A novice horse or rider will increase in understanding of the aids with each attempt.